Commentator Phil Liggett often reminded viewers throughout the past three weeks that there’s no shame in finishing last in Le Tour de France. Of course, surviving 21 stages to finish in Paris is always a feat for any rider. This year’s last-place finisher in particular has shown himself to be the most respected recipient of the “lanterne rouge” in recent cycling history. Only five Americans competed in this year’s Tour de France out of 176 riders to start. The U.S. needed to make its mark on Le Tour once again, and, well… it happened. While the amazing Peter Sagan took three stages and survived a third-week crash to finish with his sixth green jersey, Philippe Gilbert climbed back up the wall over which he flew to complete the day with a broken kneecap, and the consistent-yet-cracking Chris Froome squeaked his way onto the final podium alongside his maillot jaune-winning teammate Geraint Thomas, the most impressive display of sportsmanship in my opinion, and that of many, came from this year’s holder of that lanterne rouge. My hat– or rather, my helmet– is off to Lawson Craddock, not only the first American in Tour de France history to earn this final designation, but also an inspiring fighter in the face of overwhelming physical, mental and emotional challenge. At last, three typically grueling yet glorious weeks have seen their end. At last, it’s a very special viewpoint. And at last, good can come. C’est Le Tour, encore! Le Tour de France is underway once again, this year almost entirely in France! Here they pass once again in 2018, along the exact spot starting up Gibraltar Road in which I caught them two years ago. 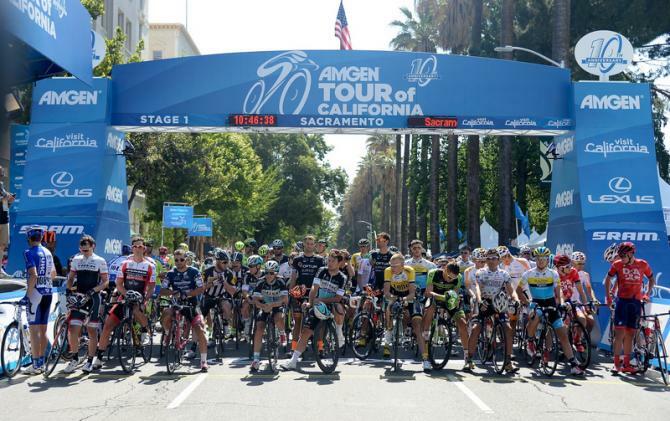 This year’s Amgen Tour of California didn’t fail in providing another 15 seconds of seeing the pros up close in action! Here are the stage results of the day. 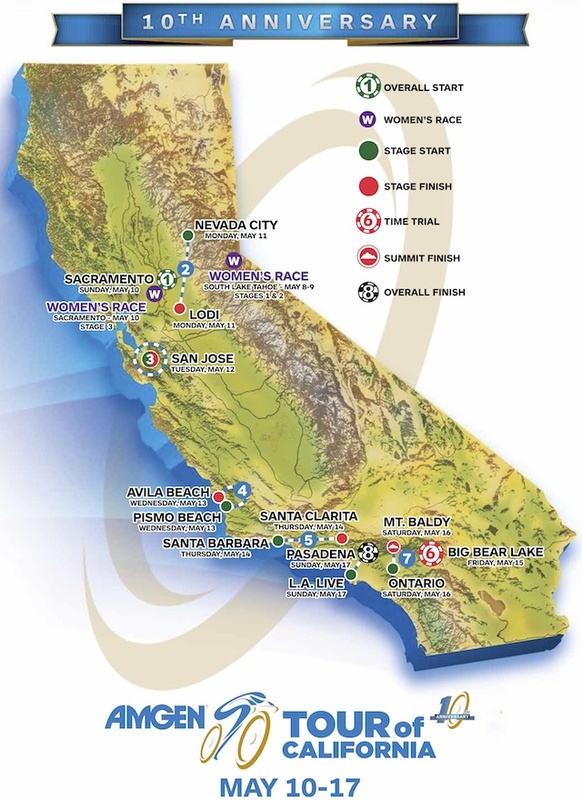 Just in the nick of time, I made it via my “secret” route to catch a glimpse of this group of professional cyclists climbing Gibraltar Road, on stage 3 of the 2016 Amgen Tour of California. It’s always a pleasure to get my annual peek at the pros in action! As the sprinters raced to the finish line of today’s primarily flat stage, my own thoughts sped along with them. Would this finally be Peter Sagan’s day, giving him a well-deserved first Tour win of the year? Or rather, would “The Missile” take back-to-back stage victories and up his magic number to 25? As usual, they got to the front of the peloton in those key final moments today, after both having to do some unusual– for them at least– catching-up. Bike trouble delayed Sagan momentarily, while Cavendish picked himself up from a crash. From there– impressive as always– it was all about teamwork and rolling mechanics to put them back in position. Talk about thinking fast. It turns out my speeding thoughts couldn’t keep up, because I was wrong on both questions. The Missile had to settle for the number four spot today, while the 23-year-old Slovakian saw his THIRD second-place finish of the year thus far. After all these “seconds”, I’m really looking forward to a stage win for Sagan. For now I’m glad he holds onto the sprinter’s green jersey. In any case, another day in France is done, now with four more rider losses unfortunately. 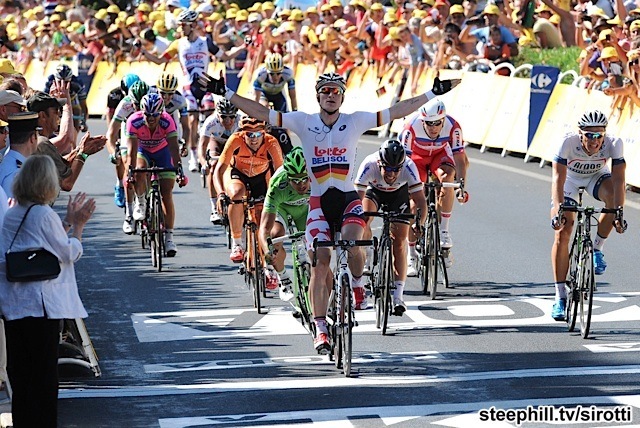 Today’s accolades for stage 6 go to– in addition to the impressive teamwork of Sagan’s Cannondale and the valiant yet unsuccessful effort of Nacer Bouhanni– the big winner du jour of course, the always-powerful Andre Greipel.